Tap “Confirm MAC Address.” The MAC Address will be displayed on your screen. In the Settings Menu, select “About.” This could be under the “General” tab, depending on the version. The MAC Address will be listed as either “Wireless ID” or “Ethernet ID” depending on the connection. Download the Amazon Alexa app to your phone or computer and sign in with your Amazon account. Connect to the wireless network transmitted by your Echo device. The wireless MAC address for your Echo can be found at the bottom of the Echo Setup screen in the Alexa app. Press “Menu” from the Home screen. Select “Settings.” The MAC Address should be located in the “Device Info” section. Select System Settings on the Home screen. Scroll down through menu and select Internet. The MAC address will be listed under System MAC Address. Power up the PlayStation 3 without any disc in the drive. Power up the PlayStation 4 without any disc in the drive and wait for the menu to pop up. Navigate to the“Settings” icon (located on the far left). Select the “System” icon under the Settings menu. You will see your MAC address (LAN cable) listed. The MAC Address is located on the bottom or back of the Roku player (depending on the model). Go to the Dashboard>My XBox>System Settings>Network Settings. From there go to Configure Network and then the Additional Settings tab. Scroll down and select Advanced Settings. You will see the Wired MAC Address on the left of the screen. This 12-digit sequence is the address you need to send to the Help Desk. Scroll down to Advanced settings. On the right-hand side there will be the Wired Mac address. This 12-digit sequence is the address you need to send to the Help Desk. From the Wii U menu, select System Settings. Select the Internet icon in the menu. Select the View MAC Address option. If you don’t see your device listed here, send us the make and model, and we’ll help you find the MAC address. Note: Gaming systems, being consumer products, typically do not support 802.1x enterprise security, therefore you cannot register them on the BishopNet wireless network. They can, however, be registered on the BishopGuest network, although they must be registered by Information Services. 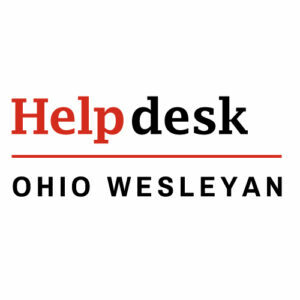 To do so, the WiFi MAC address must be sent to helpdesk@owu.edu along with your student username.